US: Dems Launch Campaign For More Women In Office. McConnell talks coal, rallies GOP women. Women voters push McAuliffe ahead. 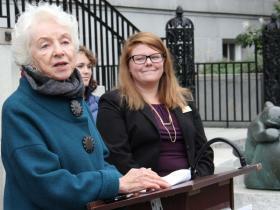 Former Governor Madeleine Kunin with Rep. Sarah Buxton (D – Royalton/Tunbridge). Democrats Launch Campaign For More Women In Office Vermont Public Radio Former Governor Madeleine Kunin doesn’t want to be known as the only female governor in Vermont’s history. She announced Monday that the state is joining 13 others in Emerge America, a San Francisco-based 501c(4) non-profit seeking to get more women Democrats into elected office. “There’s room on the statehouse walls for another portrait,” Kunin said, referencing the tradition of mounting a portrait of each governor in the statehouse. She hopes another woman’s portrait will join her’s there. Pelosi Visits Puerto Rico, Talks Women’s Issues ABC News U.S. House Democratic leader Nancy Pelosi says the United States should follow Puerto Rico’s lead when it comes to maternity leave laws…. Women voters push McAuliffe ahead, polls find wtvr.com WASHINGTON (CNN) — With six weeks to go until Election Day and one day until a crucial debate showdown, two new polls indicate Democrat Terry McAuliffe on top of Republican Ken Cuccinelli in the much watched battle for Virginia governor. And according to both surveys, released Monday night from NBC4/NBC News/Marist and Washington Post/Abt SRBI, McAuliffe’s advantage seems to be fueled by his lead among female voters….McAuliffe holds an 18-point lead among women voters in the NBC4/NBC News/Marist poll and a 27-point margin in the Washington Post/Abt SRBI survey, with Cuccinelli leading by only 10 points and eight points among men in the two surveys. More female Democratic candidates wanted, needed BurlingtonFreePress.com Six female members of the Vermont House of Representatives flanked former Democratic Gov. Madeleine Kunin Monday as she announced the launch of Emerge Vermont, an organization that will recruit, train and mentor Democratic women to run for political office. Kunin said Vermont could be proud that 41 percent of the Vermont Legislature is female and half the 96 Democratic seats in the House are held by women. The 30-member Senate, however, has only nine women, seven Democrats and two Republicans. Native American Woman Is Nominated to Federal Bench But Why … Huffington Post …And so, it came as a pleasant surprise on Thursday, when the president announced he was nominating Professor Diane J. Humetewa to serve on the U.S. District Court for Arizona. Humetewa is a strong nominee and should pass confirmation in the Senate with little trouble. A nationally-recognized expert on Native American legal issues, she has a longtime supporter in Sen. John McCain, who, along with then-fellow-Sen. John Kyl, aggressively lobbied then-Pres. George W. Bush for her nomination as U.S. Attorney for Arizona in 2007. Nancy Pelosi to discuss women’s economic issues in Tampa Bay News 9 TAMPA — Nancy Pelosi, Democratic leader of the U.S. House of Representatives, will make an appearance in Tampa on Monday afternoon to discuss women’s economic issues. She is expected to join U.S. Rep. Kathy Castor, D-Tampa. They’ll talk about equal pay for women and other issues that are part of When Women Succeed, America Succeeds, a new agenda that advocates the economic advancement of working women. McConnell talks coal, rallies GOP women during Louisville convention WAVE LOUISVILLE, KY (WAVE) – Campaigning continues a year before the election. Senator Mitch McConnell visited the National Federation of Republican Women’s convention where he addressed a captivated crowd of GOP supporters. McConnell is trying to rally his base, especially women, as he recruits as much support as he can considering he has a potential female opponent. Democrat Alison Lundergan Grimes, currently serving as Kentucky’s Secretary of State, is also running for Senate in 2014. Study finds sexual and domestic violence widespread, largely … CBS News An estimated 22 percent of Americans say they have been a victim of domestic violence, and 13 percent report being the victim of sexual assault, a women’s awareness group reported Monday. Next postMiliband meets Feminism 3.0. Page 3 girls ‘an anachronism’. African women blazing a feminist trail.